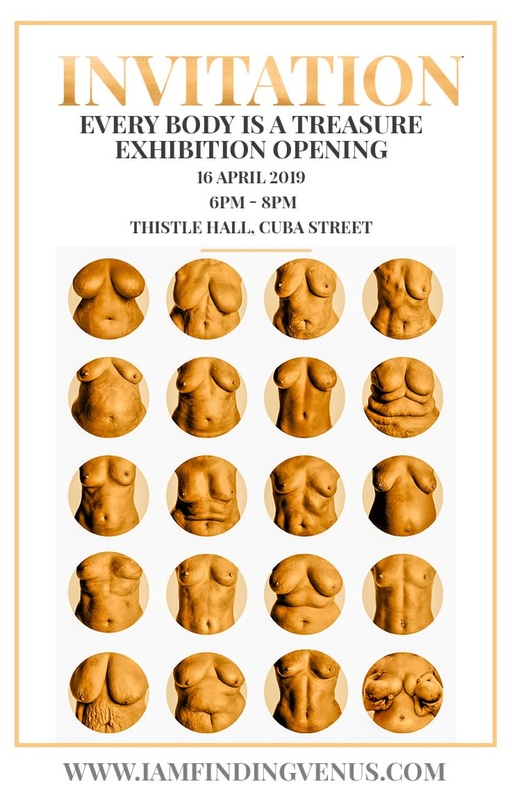 Photographic Exhibition featuring 240 images of women covered in Golden Clay. Created as a gift for all of the women who don't fit the very narrow and artificial definition of beauty. 2 years ago my niece walked into my kitchen. She was 5. I was flabbergasted. What the %$#%* was a 5-year-old doing worrying about a thigh gap? I think my response to her was limp at best as I found myself triggered to the point of becoming pretty speechless. When I regained my composure I decided to make her a gift. And a gift for other girls and women as well. I decided to put an ad out on facebook and ask women to let me honour them by covering them in golden clay and photographing them anonymously so that we could create a counterpoint to the distorted narrow bandwidth that girls get to see as "normal.". I am about halfway to where I want to get to with 600 images but the journey has changed my life. First I learned that even though I was a luscious sized woman myself, I had biases against bigger women. 40 years of cultural indoctrination will do that to you. I thought I was evolved...I learned I wasn't. I thought I was self-compassionate... I learned I still had a long way to go. This project has caused me to evolve in so many ways and has taken me on a journey I could never have anticipated. --Started an Arts based Youth Program called the HeArtivists to help girls to develop creative resilience. - It works with both the girls and those that love them to help offset the mental health challenges being faced by our Digital Native generation.